Hello! My name is Jacob Andresen. I collect my thoughts and findings about software craftsmanship here. To better understand the historical context I think all web developers should be at least familiar with a basic description of the MVC pattern and familiar with the existing frameworks that are allready available. something that we know today as the waterfall model . Software modelling was (and still is) done by using metaphors to map user needs into software and carefully designing the sofware using object oriented constructs. One prevalent approach was to apply the MVC pattern invented by Trygve Reenskaug in 1978 while visiting Xerox PARC. Controller - Responsible for controlling the flow in the application and sending data back and forth between the model and the view. The MVC pattern has been been the foundation for many of the modern user interfaces and frameworks we know today. Examples include Java Swing, Ruby on Rails and asp.net MVC . It should be noted that most of the listed frameworks now have implemented MVVM as an adaption of MVC. Microsoft introduced MVVM as an adaption of MVC to with considerations about the costs of exposing the entire model to the view. This was originally available via Silverlight and WPF and to some extent Adobe Flex - but has now been widely implemented by other frameworks. Jokes aside … It is important to understand that taking the MVC paradigm and applying it on web application programming in the same manner as you would have applied it to application programming in the PC era could be considered harmful. The web has a entirely different delivery mechanism than your local PC had. The main difference between a local pc application and a web application today is typically that the web application involves data available from another machine. This should not pose a noticeable problem when rendering logic is expressed on the server - e.g when all the view is rendered via one call to the server. But if the view is constructed on the client side and requires several calls to fetch data e.g for a compound view then this could pose a problem performancewise. It should be immediately obvious that a solution where all data comes prerendered will be faster than a solution that requires data to be assembled via several calls. When you also consider the added complexity of tackling layout changes as a result of unpredictable results then you could start considering looking for ways to improve performance. So - one obvious choice would be to minimize the amount of needed calls to the server. First of all - You should think very hard about what you are doing if you are planning to roll your own MVC framework. If you are going to do it anyway I hope you at least browse through the allready available frameworks and familiarize yourself with the basics of MV* and understand the performance penalties of cleanroom MVC. I got the chance to visit the Picasso museum in Barcelona in April 2014. Here I saw the collection of Picassos interpretations of Velasquez “Las Meninas” that he completed during the later stages of his career. During my visit to the museum I saw some dutch high school students that had been given the task of sketching their own version of Picasso’s version of Velasquez’ work. It was fascinating to watch - it looked like that some of them were approaching the task with a high level of energy and some of theme seemed quite indifferent to the task. Sitting there, watching students create an interpretation of an interpretation I realized that I lack ways to describe how software development ideas are formed. Software development, like art, is underpinned by tradition. The software development community has developed a tradition of capturing and sharing ideas via “Software patterns” - some of the most influential being captured by “The gang of four” in “Design Patterns: Elements of Reusable Object-Oriented Software” and “Patterns of Enterprise Application Architecture” by Martin Fowler. But I have come think of the limitations of design patterns. The most striking way I can describe the limitiations is to describe how hard it is to express how the visual vocabulary from Velasquez “Las meninas” is carried over to the Picasso version. These are two completely different works of art but it is obvious to the onlooker that the scene is the same and the ideas are the same, but that they are expressed in different ways. 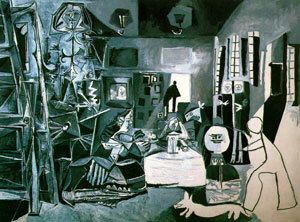 It seems to impossible to form an exhaustive list of patterns to describe to describe Velasquez ‘“Las meninas” that can be used to describe the Picasso version. But when you stand there and watch it seems obvious. Another way to describe the limitations of design patterns would be to point how hard it is to describe the success of Ruby on rails and how it has influenced modern web development. Rail encompasses most of the popular enterprise design patterns, but the Active Record in particular. Rails stands as pillar stone in the formation of ideas for modern webdevelopment frameworks today - I would consider it the “Las Meninas” of web development. I see the inspiration from Rails in most of the other web frameworks I use today. Granted, some of the ideas expressed in Rails can only be expressed by a combination of tools - e.g I would choose a combination of express and yeoman as the “Picasso version”. Today - Rails itself and frameworks being inspired by it are hardly comparable - but when you sit there and watch , the feeling is the same. Every now and then we talk of a “paradigm” shift in software development. I do not think that the word “paradigm” is adequate to describe the plethora of tools that we have available today being inspired by Rails. I think that a word could be used is “Episteme” as used by Foucault in “The order of things” . In my understanding of the word it better expresses the unconscious choices we make due to our cultural settings and influences ( our “epoch”). I am just starting out reading the works of Michael Foucault . The introduction to “The order of things” where he describes “Las Meninas” in great detail fascinates me. I look forward to the journey. I hope to find new ways to describe how software ideas are formed. When poking around in the jquery and jquery ui codebases I noticed an extensive use of qunit from grunt. I get it that the jquery guys also did qunit - so this makes sense. But why grunt? I remember the earlier versions just used makefiles. This should take you through an example of using grunt on an existing project. If all goes well then all the tests should pass and a new jquery-ui build should be avaible to you inside the “dist” folder. The major strength of grunt is its strong tradition for plugins - but when starting up it can also be a major drawback. you need to setup some plugins to be able to start working. It does not help that the grunt-init command has been separated out in a plugin in version 0.4 (most of the existing blog entries just refers to it as being inside grunt) . See The Project scaffolding section in docs for more information. Note that my username is “jacob” and that I am on windows here. You will probably have to insert another directory. Warning: Existing files may be overwritten! Used --force, continuing. grunt after generating the Gruntfile, and it exits with errors, edit the file! Note that once you have created package.json describing your dependencies, then you can simple write “npm install” to install your dependencies. There is no need to store the “node_modules” folder in your version control system. Qunit replaces junit and phpunit on the frontend. After installing grunt-contrib-qunit and enabling it your gruntfile you now have the option of writing automated qunit tests that can be run directly from grunt. grunt-contrib-qunit uses phantomjs behind the scenes to enable you run your tests directly from grunt (without opening a browser). This should make it easier to automate your tests. I think that best way to learn qunit is to look at existing tests. The button core test in jquery ui is a good place to start. Here we expect 1 assertion to be run. So. Lately I have been advocating a switch to postgres from various BigCo databases. I have been inferring that “postgres” is “just better”. But basically I don’t have a clue. I am not a database expert - and I did not take the advanced database classes in school. So - why I am I doing this? I believe in having the source available for all my tools.This is just a personal preference of mine … I like to poke around to learn new stuff .. discover new ways and combine projects in new ways .. but mostly I like to learn from the insights of others. See implementation tidbits buried deep down. My list of projects to poke around in is long. Postgres is just one of the projects I’d like to poke around in. So - now I am going to poke around in postgres. Let’s see if we can compile it on window 7. I’ll just write down notes as I go along. Are you ready? Bring forward your wooden stick! So - the plan is to compile C/C++ code on windows. To do this you need a C/C++ compiler. I’ll just take the easy route here on windows and download Express 2012 for Windows Desktop . Note that you need to register to do this. Downloading and installing Visual Studio Express can take a while. Then you need git . If you have been living under a rock for the last decade, then git is a distributed version control system - popularized by the linux kernel and github.com . You can grab a windows installer on git-scm.com . Go ahead and install it if you do not have it yet. You’ll be glad you did. After a while then you should have the source code available . If you are like me ,then you’ll probably hurry into \build\postgresql\src and notice win32.make. Maybe this will work? Luckily there is \build\postgresql\src\tools\msvc\build.pl . Huh ? What’s *.pl files ? That’s perl. If you don’t know what perl is , then you are in for a treat. Grab active state perl and install it if you don’t have it yet, so you will be able to process the file. Project "D:\Build\postgresql\pgsql.sln" on node 1 (default targets). Building with tools version "2.0". Done executing task "Error" -- FAILED. Oh.you probably spotted it also. “Detected hardware platform: win32”. I ran this using the “Developer Command Prompt for VS2012” - maybe this targets win32 pr default? If I select “Microsoft Visual Studio 2012” > “Visual Studio Tools” > “VS2012 x64 Cross Tools Command Prompt” and execute “build” again - then it works! Now I can use postgres from c:\postgres ! Note that this is a random example. Right now I have a limited understanding of the postgresql codebase, so following the hardening guidelines from OWASP seems like a good idea. First of all I installed jetty using “sudo aptitude install jetty” , then I grabbed the geoserver source from http://svn.codehaus.org/geoserver/trunk/ and compiled it using openjdk-6 and maven 2.2 (looks like the build fails using the standard maven in debian, so I grabbed a version of maven from ftp://mirrors.sunsite.dk ) . After compiling, I copied geoserver/src/web/app/target/geoserver.war to /usr/share/jetty/webapps/ and restarted jetty using /etc/init.d/jetty restart . I have spent considerable amounts of time thinking about the concept of information and how to convey it in software. Some years ago I came to the conclusion that I want to present information in context, e.g not present crude extracts from databases, but adapt it to the presentation context, with the user in mind. Some useful contexts could be “location” or “social networks” - the context should be varied depending on the type of information context - e.g information about abstract concepts have no use of location information. The use of context should increase the likelihood of the information being conveyed to the user in a understandable manner. When I observe users, I rarely see one user that uses only one tool to achieve her goal. Information gathering is usually done using a variety of sources - so a good system design principle could be to know where the system should stop - and how to present the information in a such a manner that supplemental or related information can be retrieved from another system. So , to me, presenting information in context is also about presenting the least amount of “friction” in the system. Here I consider any obstacles hindering information flow in and out of the system as “friction”. By minimizing the “friction” we make it easier to present information in context by connecting data between systems. This has lead me to think that good system design should focus on how information is shared between users via connected systems. Turning the attention to how information is shared between users via connected systems, then we obtain a understanding what the data is (since we need to be able to share it). When talking to people about BDD and my lame example using Paris Hilton, then I got the question “it was really interesting reading about Paris Hiliton .. but what is BDD really about?. 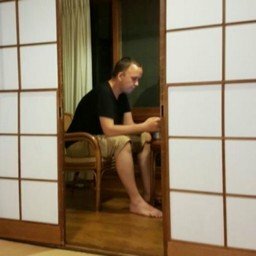 The central insight of BDD is that TDD is really computer aided specifications of the executable behaviour of your system. BDD tries to express this using a Domain Specific language. Back in 2006 , Dave Astels described how to ascend from the focus on 1-1 testing of production code to use the test proces as a way to describe the way you want your system to behave. In the video Dave makes the valid point that “The words you use shape how you think”. So we should go away from thinking about “testing” constantly to think about describing how you want your system to work. So to me - BDD sounds like a kickstart to be productive in TDD - and do it well from the start. So if you are starting out on TDD , you should really start out doing BDD. Recently, I have been giving Behaviour Driven Development some thought. Let’s take a an example of how to develop and test a music video search and storage system. A traditional way of developing this would require formulating a object oriented system architecture, thinking about streaming and metadata enabled search. The system architecture could consist of a well chosen database server, a streaming server and a metadata enabled search engine - combining these technologies with a modern UI and encapsulating theme in carefully designed object oriented structures. During all these important choices , and all during development we would make sure to write tests before we write a single line of code. All these things put together would lead to a well thought out system architecture , but all the effort put into the system architecture can be in vain - if we don’t have a solid business understanding of what a video storage system should do. What will the users expect? Take the phrase “when you are with somebody else, that’s me in your eye”. There is the obvious interpretation of the sentence . But thinking about that sentence also let’s you reflect on the real meaning . When you look at Paris Hilton in this video, what do you see? Do you see the pretty blonde or the millionaire , hard working young girl . In this video I am seeing the image of the pretty blonde - but I am also thinking about the millions of dollars she is earning portraying herself in this way. So in a sense - I am reading the original message out of context. I am admiring what Paris Hilton in some other way than she intended - the original meaning of the words seem to have disappeared - but my understanding of the sentence is more useful to me. I wish I could do what Paris Hilton does - but in a way that would make sense in my world . The producers of the “Nothing in this world” video are not likely to convey information about the business empire of Paris Hilton in the metadata supplied for the video. So a system formulated as a “video storage system” would not let me exploit the information I found in the facebook group. BDD introduces the use of a Domain Specific language to express the users expectations in a manner more directly focused on the behavioural aspects of the system. This lifts the clouds from the system aspects and focuses on intent. If I had those expectations formulated to me , then I would choose to implement this system as a mashup between youtube and facebook as a facebook application. This would be a radically different system architecture than the one describe above. Furthermore , by leveraging one of the several BDD test frameworks available, then the expectations could be formulated in way that can be used as tests. Listed as one of the of five deep questions in computing , this questions stands out to me as the one question we have to answer before we can answer questions like “what is computable” and “(how) can we build complex systems simply”. To me the concept of “information” only makes sense if it can be extracted or related using wellknown techniques. In this sense “information” is put in the context of a “subject” and a “object” , e.g. the information identifies facts about the “object” in a manner that is understandable for the “subject”. When information allways should occur “in context”, then it should be clear that the information should be codified in a manner that is understandable by the “subject”. This “codification process” is successfull when the information about the “object” is conveyed to the “subject” in a manner that is easily understood - so in my interpretation “information” can be expressed in many ways , and still be intended as the same information about the the same “object”. In most concrete circumstances involving human communication “codification” will mean “telling” somebody “else”. E.g saying “I am hungry” .. or “do you mind passing me the water”. Information is revealed through use of language in a sentence and placed in the context of the situation where the sentence is spoken. In most traditional computing software information is stored to examine facts about phenomena or physical items. The wealth of information in context has been lost in the process of gathering these facts. Take a traditional supply store. It is not very common for the desk clerk to capture the facial expression of the customers while entering the items bought in the cash register. So in this way, the information from the facial expression is available to the desk clerk but not the store manager. In our current computing systems, then it is not easy to compute “the mood of the customers” - but if we understand the wealth of information lost in the “codification process” then we can exploit this for a better understand of the market siutation . But we will still not be able the compute the “mood of the customers”. So - to me information can only be understood as “information in context”. I will try to design complex systems from this where it makes sense.